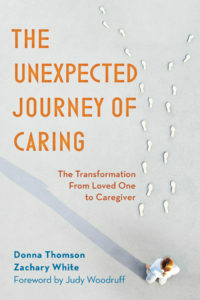 As caregivers, hope is not a luxury—it’s a necessity. It’s something we need to keep us going throughout the day in light of the sometimes all-too daunting challenges of the moment. While most of us lean on hope, I want to remind us that hope, at its very core, requires us to be close to the very challenging situations that call forth the need for hope itself. Too often, we mistake hope for a wish. A wish is something we want to happen. Hope, on the other hand, is an expectation. At first glance, they are remarkably similar but the small differences between the two are quite profound. When a medical test comes back positive, we could wish away the results. But wishing away the results doesn’t change the reality of the situation. When someone we care for no longer responds to the sound of our voice, we could wish that she will awaken the next morning with mental clarity. But this wish means that we will close our eyes to the reality before us and await for tomorrow, all the while, neglecting the person in front of us. When someone we love is in physiological pain, we could wish the pain would go away. But this wish also means denying how the pain our loved one is experiencing might be changing how we can and should relate to the person in front of us. A wish is about a desire to return ourselves and our loved ones to life as it was once lived—to undo the cancer diagnosis, to remake someone’s physical condition, to bring us back to a time before pain. A wish is a passive act. When we wish, we stand far away from the situation, diagnose the situation, then try to eliminate the “problem” in one fell swoop. All the while, a wish protects us from stepping into the very situation that is so frightening. Hope, on the other hand, isn’t a solely private act of desire that we conjure in our head. Rather, hope is a social product that is shaped by our experiences with others, in the world, as we attempt to make sense of and respond to the unfolding situations before us. When a medical test comes back positive, hope won’t take away the results away. Rather, hope orients us differently to our loved one, his doctor, and our own families. Our hope, or our positive expectations, keep us both focused on the challenges of the moment and compels us to keep moving through that moment. It lets others know how we choose to respond. It lets our loved one know that we will not abandon him even though the test result is not the result we had wanted. When someone we care for no longer responds to the sound of our voice, hope doesn’t mean we deny how our loved one has changed. Rather, hope allows us to respond by continuing to care, continuing to talk to our loved one, and continuing to believe that they feel our presence, even when they may not be able to communicate this reality. When someone we love is in physiological pain, hope doesn’t mean we give up. Rather, it means we acknowledge the reality of our loved one’s pain, and then respond by doing everything we can to alleviate his suffering. Wishes call forth certain realities by indulging in denial. Hope, on the other hand, does not delude us into believing that our lives will magically appear different. Hope draws us into the very situations that frighten us and positions us to respond by drawing upon the social resources of deep compassion and acknowledgment. Where Did My Peers Go?